엘 카타파테 시내에서 400m 떨어진 Hosteria Hainen은 정원으로 둘러싸여 있으며 안데스 산맥의 전망을 감상하실 수 있습니다. 객실은 위성 TV와 무료 Wi-Fi를 갖추고 있습니다. Hosteria Hainen의 객실은 간소하면서도 아늑합니다. 난방이 완비된 객실에는 미니바 및 금고가 마련되어 있습니다. 컨시어지 서비스도 이용 가능합니다. 투어 데스크에서는 아르헨티나 쪽 파타고니아 내에 자리한 로스 글라시아레스 국립공원 관광을 예약하실 수 있습니다. 엘 카타파테는 빙하 등반 코스에서 가장 가까이 자리한 도시입니다. the staff was very friendly. location is great if you want a good nights sleep and don't want to be in the hustle of the town. we enjoyed our stay mainly because of the nice location and wonderful staff. 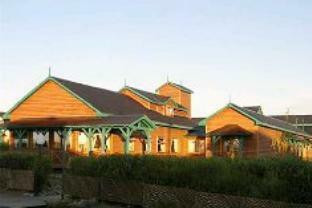 This lodge is a great option in el calafate. all the accomodation is similar here but for the price this one was great. Bathrooms were clean rooms were warm and cosy. Easy walking access to main strip in town and the staff is very helpful and friendly. U can organise them to prepare lunches to take with you on tours. The best one i think is the Big Ice trek on the perito moreno glacier. definentely a must do.